William Johnson, who came from Ohio, is the earliest black entrepreneur documented in Kingston. 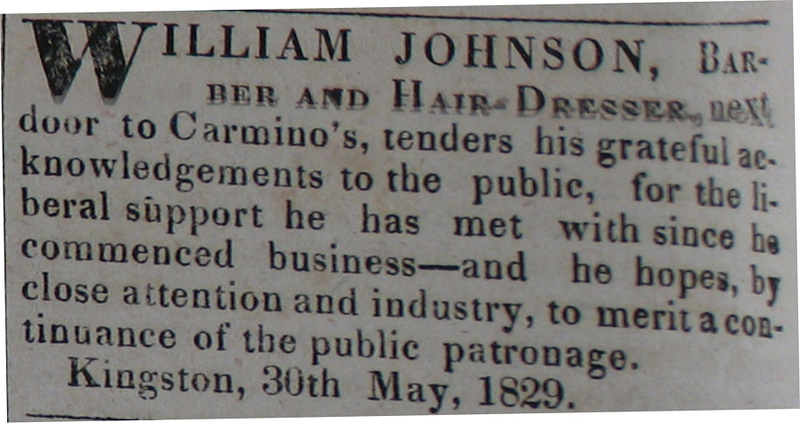 About three years after he arrived and began working as a barber and hairdresser, he placed an ad in a local paper, the Chronicle & Gazette of 30 May 1829. He thanked the public for their liberal support, and hoped it would continue. A huge fire in November 1833 destroyed ten buildings along Brock Street down to King Street. Johnson’s shop, on the west side of King near Brock, was one of those consumed. He quickly re-opened for business and continued to advertise. One ad, dated 31 March 1839, informed readers of his location at the Market Square, next door to Mr. Linton’s Auction Room, where they could get “hair cutting according to every fashion” and their Razors Honed and Dressed. Another huge fire erupted on 18 April 1840, this time on Counter’s wharf and, aided by the explosion of gunpowder stored in one of the warehouses, spread across much of the waterfront area. Strong winds helped it extend to the whole of the north block of the Market Square, and to most of the next block up to Store Street (now Princess Street). Being one of many victims burned out, Johnson set up shop briefly in his residence at 49 Earl Street (a previous tour stop), but by 5 May was back on Brock in the brick-front house above Messrs. William and Joseph Wilson. Four months later he moved yet again, this time to the Chronicle Building, second door from the corner on Brock Street, north side of the Market Square. Here he continued to serve his customers for the next sixteen years. Having suffered from fire to his business premises, he had the good luck to have his home at 49 Earl Street survive a surrounding fire in October 1851. But more misfortune was to follow. At around three o’clock in the morning of 15 March 1856, the sound of a fire alarm roused the citizens from their slumbers. 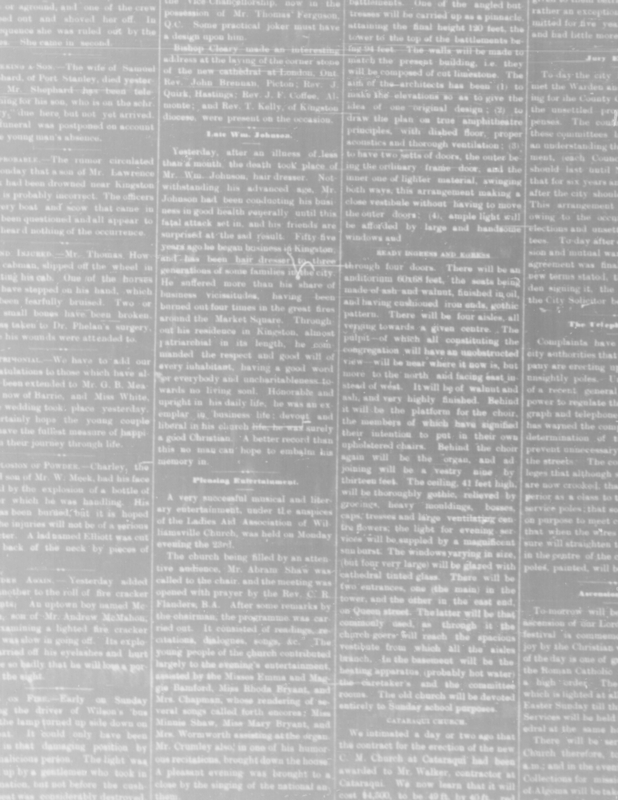 Flames were issuing from W. Lightfoot’s Printing Office over Johnson’s Barber Shop. The firemen were quickly on the spot, but there was no water in the hydrants and none to be had anywhere, as the water was shut off. Water had to be pumped about 150 yards from the frozen harbor to the scene of the fire; the firemen spent seven hours battling the blaze but only managed to prevent it from spreading any further. Henry J. Martin’s Grocery Store, at the east corner of Brock and King Streets, was destroyed as well as the neighboring premises of Lightfoot’s Printing Office, Messrs. O’Rielly & Macarow’s Law Office, Capt. Taylor’s Fire Insurance Office, Mr. Wm. Johnson’s Barber Shop, and Mr. Corkill’s Tailor Shop. 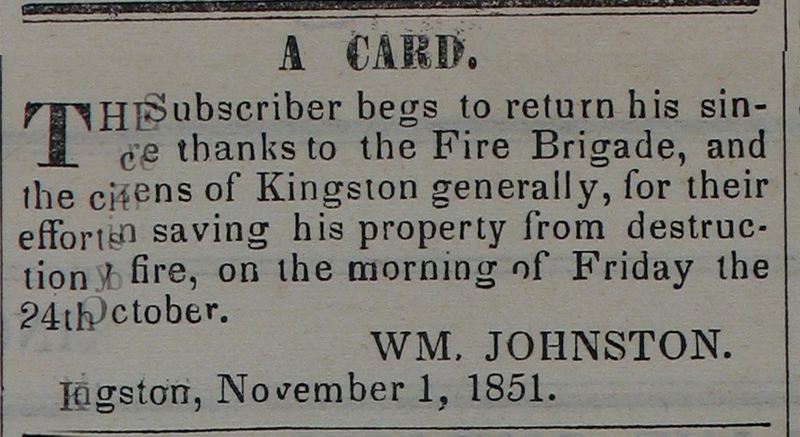 On 3 May another “Card’ informed the public that Johnson had re-opened his Hair Dressing and Shaving Establishment at the corner of King and Johnston Streets. He had bought part of lot 86 on the south east corner of this intersection back in December 1840, and appears to have operated his shop here, without any further trials by fire, for the rest of his career. William Johnson died on 24 May 1881, having been able to continue working until less than a month before his demise. From his obituary we learn that he had come from Ohio 55 years ago. He “commanded the good will and respect of every inhabitant…” “Honorable and upright in his daily life, he was an exemplar in business life; devout and liberal in his church life, he was surely a good Christian.” His funeral was conducted from Sydenham Street Methodist Church to Cataraqui Cemetery. Both of his sons followed in their father’s footsteps. The eldest, William Jr., died in Australia at the age of 35. James B. Johnson became known as Prime Minister John A. Macdonald’s barber.